As public and private partners in Greater Tremé and Lower Mid-City work to restore the Claiborne corridor to economic and cultural vitality — and as the Claiborne Expressway and its deteriorating ramps face up to one hundred millions of dollars in reconstruction— a new study of traffic data and circulation patterns concludes that removal of the freeway would bring important benefits for surrounding neighborhoods and New Orleans as a whole. It concludes that the replacement of major segments of the Claiborne I-10 freeway with a restored urban boulevard would result in a well-functioning transportation system that meets regional needs while promoting the economic and social rebirth of the once-vibrant Claiborne Avenue and its surrounding communities. This study — commissioned by a local coalition dedicated to a brighter future for the corridor and conducted by the transportation engineering firm Smart Mobility — is the first detailed effort to assess the impact of the possible freeway removal that receives serious consideration in the city’s new draft Master Plan. At a development-oriented meeting last week, Mayor Mitch Landrieu said that the removal of the Claiborne Expressway deserved further attention and study. The study uses state traffic data to compare transportation system performance under both the current configuration and scenarios that would replace all or part of the freeway between the Pontchartrain Expressway and Elysian Fields Avenue. It finds that a boulevard and nearby surface streets would have ample capacity to absorb and efficiently move traffic in the absence of the freeway. The majority of drivers who use the Claiborne for short trips would see minimal increases in travel time and benefits from fewer surface street obstructions. Even those using the freeway for longer trips would see small increases in travel times, just 2-3 minutes under one scenario and 3-6 minutes under another that would replace a longer stretch of freeway. After briefings with city officials over the past two days, the partners who commissioned the report — the Claiborne Corridor Improvement Coalition of the NEWCITY Neighborhood Partnership — are releasing the study today. It is available for download at http://cnu.org/restoringclaiborne. CNU CEO John Norquist, transportation engineer and report co-author Lucy Gibson, Urban Design Research Center President and CEO Clifton James and other coalition partners will be available for media interviews today, Thursday, June 22. Contact Stephen Filmanowicz of CNU at 312-927-0979 to schedule these interviews on site near Claiborne Avenue. Images: The Claiborne Corridor as it appears today (lower) and after removal of the Claiborne Expressway with restored traffic circle (upper). Renderings by Mac Ball, Waggoner & Ball Architects. This report builds on planning efforts stretching as far back as Clifton James’ and Dr. Rudy Lombard’s 1976 “Claiborne Avenue Design Team Report,” commissioned by the Louisiana Department of Highways. It also strengthens the case for the next needed step: a comprehensive engineering study of formal plans to replace segments of freeway and restore the boulevard, as recommended in the draft of the New Orleans Master Plan. That study would involve coordination among the City of New Orleans, the Regional Planning Commission and the Louisiana Department of Transportation. Demolition of the aging elevated expressway would remove an eyesore that has dominated and damaged the Tremé/Lafitte landscape for almost 50 years and held back serious attempts to spur economic development. The destruction of the oak-lined avenue and construction of the elevated expressway in the 1960s, was intimately tied to the overall decline of Claiborne’s surrounding neighborhoods and occurred against the wishes of the area’s largely disenfranchised African-American residents. 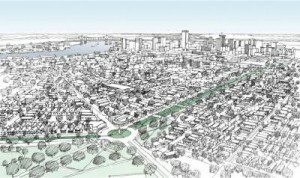 Removing the elevated expressway would free up more than 50 acres for use as public neutral ground, bike paths, transit corridors, as well as freeing significant acres outside the boulevard itself for redevelopment. In addition, a simplified interchange between the restored Claiborne boulevard and the Pontchartrain Expressway could free up valuable land near the Superdome for redevelopment. A small fraction of drivers — less than 20 percent — use the Claiborne Expressway as a through route between the east and west portions of the region and beyond. With most through traffic using I-610, the Claiborne I-10’s “use does not match the intended function of an interstate highway,” concludes the report. The average trip length on the Claiborne Expressway is a mere 1.6 miles, according to the DOT’s regional model, suggesting many drivers use it as a short-cut between nearby neighborhoods. For the minority of users traveling the full length of the elevated expressway over Claiborne, trips would lengthen by two to three minutes (off-peak and peak) under an alternative that would convert the freeway segment between Canal and St. Bernard to a boulevard, according to a review of the region’s travel-demand base model. Under an alternative involving removal of the freeway from Canal to Elysian Fields, travel times would lengthen by 3 to 6 minutes. For the larger number of users connecting to destinations such as Louis Armstrong Park, the French Quarter and downtown, connectivity would improve with a boulevard and improved street connections. Although a highly connected surface street network is a hallmark of the New Orleans system, street closures in the area over the years have actually reduced street connectivity. Removal of the Claiborne Expressway could be a catalyst to reconnect streets such as Galvez across the Pontchartrain Expressway, relieving Claiborne Avenue of its role as a primary connector between uptown and downtown. Traffic on both the Claiborne Expressway and nearby streets are substantially below pre-hurricane levels, “indicating that the capacity is available to absorb redistributed traffic” resulting from the freeway’s removal, say the study’s authors. The Claiborne Expressway is not a hurricane evacuation route designated for contra-flow traffic. It serves a role as a collector during times of evacuation but this function could be served better by a surface boulevard. NEWCITY and the Claiborne Corridor Improvement Coalition hope that this report will inform public dialogue about the Claiborne I-10 elevated expressway and demonstrate the need to pursue the comprehensive study. “More than the take down of the expressway, we are really advocating for the rebuilding of Claiborne Avenue and all the communities it touches,” said founding coalition member James R. Kelly, President & CEO, Providence Community Housing. About the NEWCITY Neighborhood Partnership and Claiborne Corridor Improvement Coalition: NEWCITY is a coalition of service providers, developers, funders, churches & faith-based groups, neighborhood associations, schools & universities and government agencies whose work center on the Greater Tremé and Lower Mid-City areas. The goal of NEWCITY is to serve as an engine for community, economic, health, education, and housing development through the exchange of information and identification of key challenges and opportunities for collaboration. At its August 2009 meeting, NEWCITY members agreed to create a separate working group to address the needs of North Claiborne Ave. The Claiborne Corridor Improvement Coalition has worked ever since to advocate for the transformation of the North Claiborne Avenue into a healthy, vibrant corridor that will not only serve as an anchor for the avenue’s neighborhoods, but also the entire City. About Smart Mobility, Inc. An expert in integrating land use and transportation, the firm has been hired by clients such as the state DOT in New York, townships in Bucks County, Pennsylvania and major regional planning organizations such as Chicago Metropolis 2020 and Envision Central Texas to provide transportation analysis and planning. About Smart Mobility, Inc. Smart Mobility has conducted transportation modeling and engineering projects in 26 states, focusing on sustainable and innovative transportation. They have worked on several projects involving the conversion of freeways to boulevards for clients including the City of Seattle and King County, Washington; the Syracuse Metropolitan Transportation Council; and the Tri-State Transportation Campaign in the Bronx, New York. About the Congress for the New Urbanism: CNU is the leading organization promoting walkable neighborhood development, sustainable communities and a healthier built environment. With a history of forming productive alliances, CNU has been at the forefront of efforts to reform how we design and build communities and their infrastructure. Learn more at cnu.org.